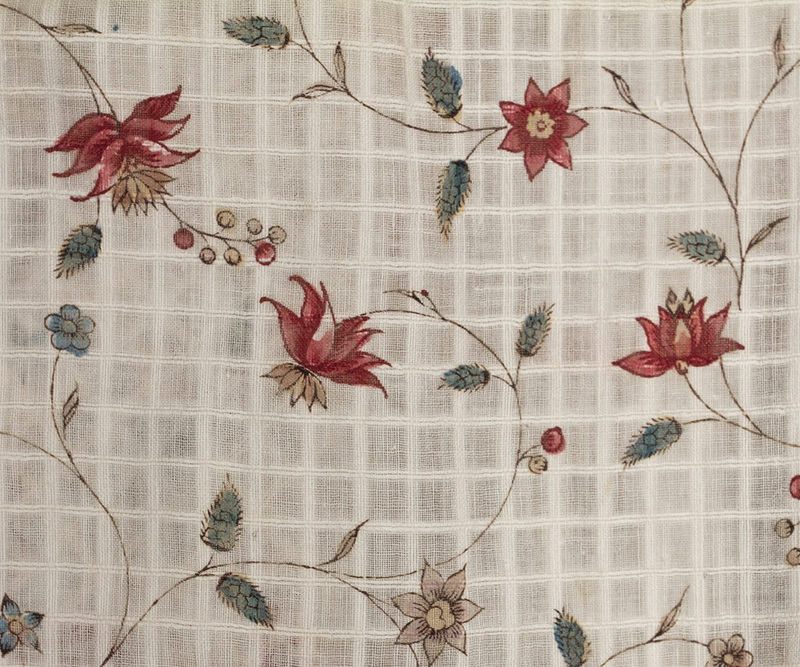 Here is a special treat for the connoisseur of early printed cottons. 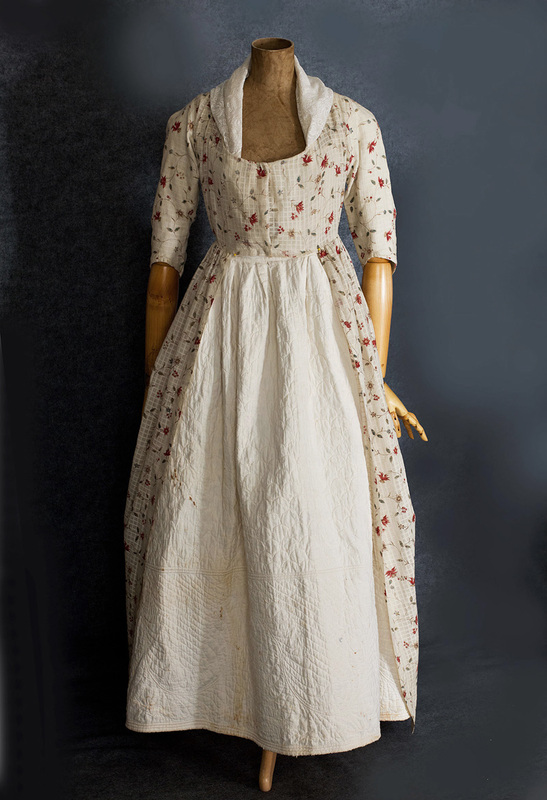 The stylish gown was made from sheer white cotton dimity printed with a repeat pattern of sunny floral sprays. The contrast of delicate flowers to the geometric textured pattern of the corded weave is of the last degree of charm. 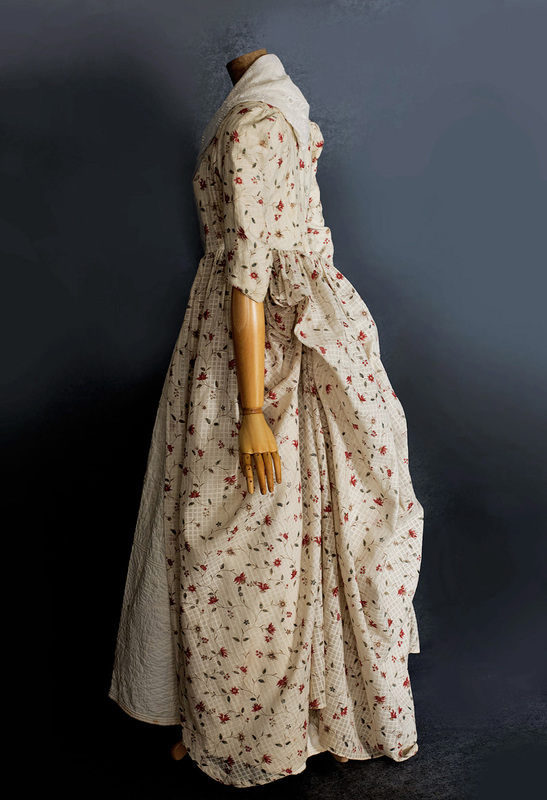 Referring to a gown made from similar fabric, the Victoria and Albert Museum wrote that "the lack of decoration and use of cotton instead of silk indicates this gown was probably worn during summer afternoons for card games and tea parties, rather than for evening dress." As an historical fashion artifact, the V&A gown is comparable to ours, which, however, is more in the "high style" than theirs. Our elegant gown, "informal" though it was, was probably meant for a lady of position and title. 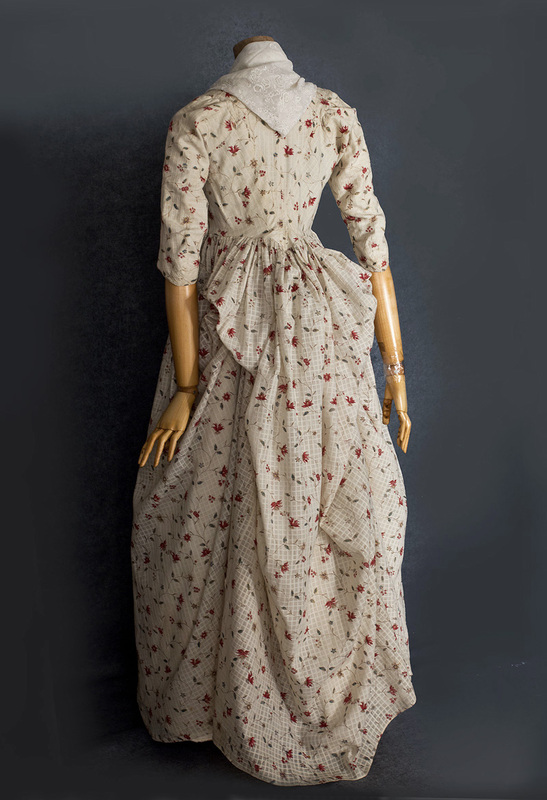 I imagine her in this gown at a rustic fete. Having gaily condescended to pay a visit on the neighboring country gentry, she wore for the occasion a suitably pastoral outfit. 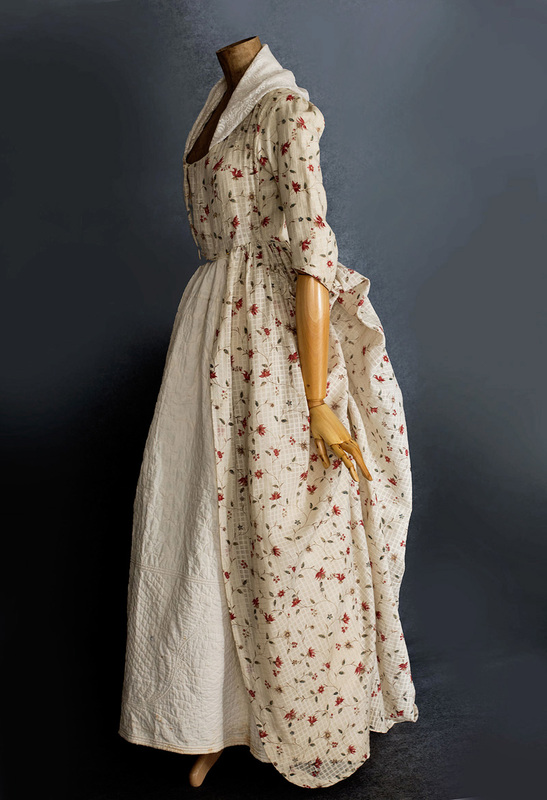 The robe á l'anglaise style has a fitted bodice back and closed bodice fronts. 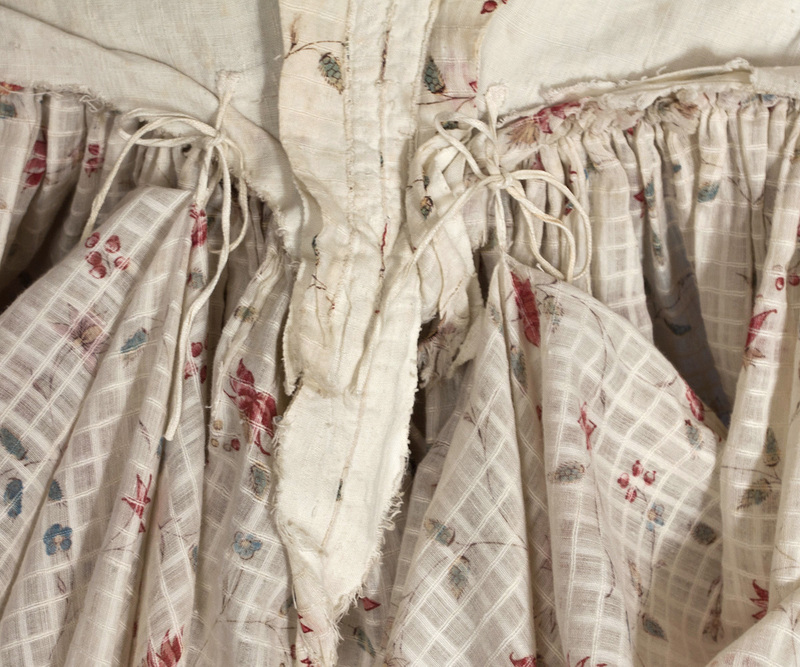 The skirt, open in front, is pulled up á la polonaise by two sets of inner cords, as in another Rococo example. 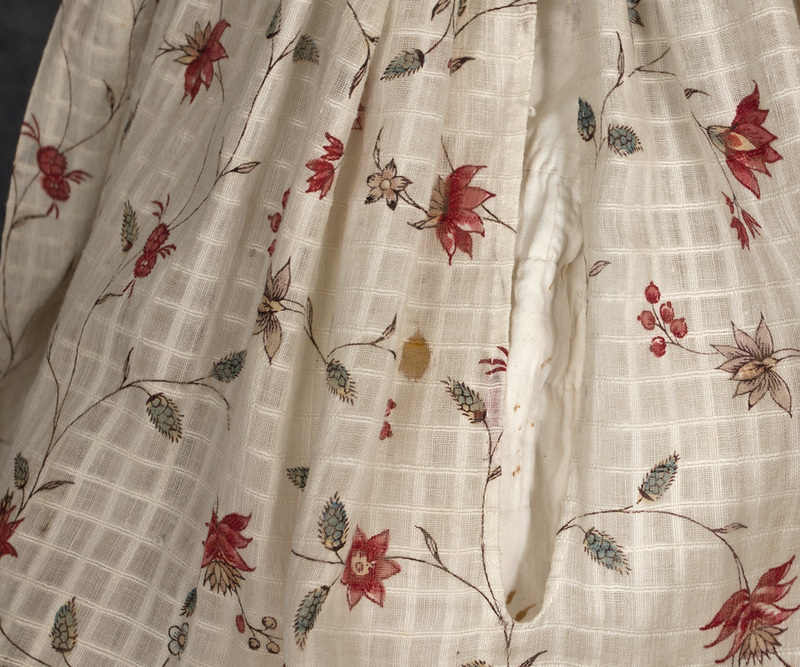 The skirt has side pocket openings. 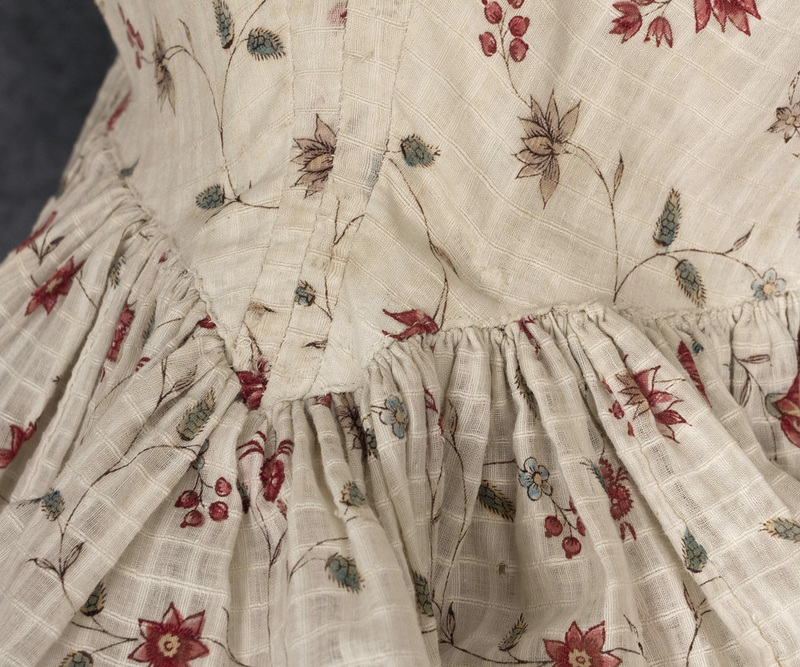 The back bodice is lined with ivory linen; the bodice fronts have linen under panels. 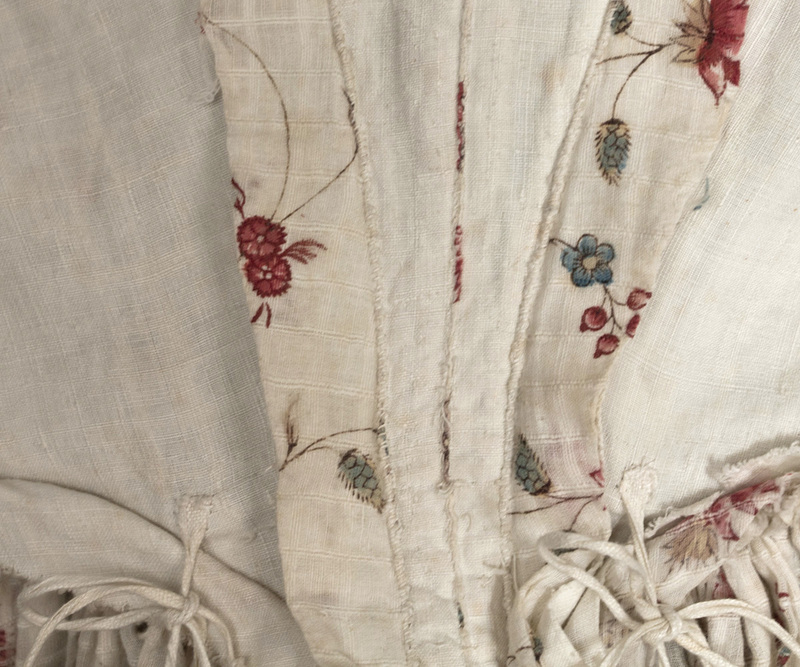 Both layers of the bodice front close with cord ties. They can be pulled as drawstrings to adjust the fullness. 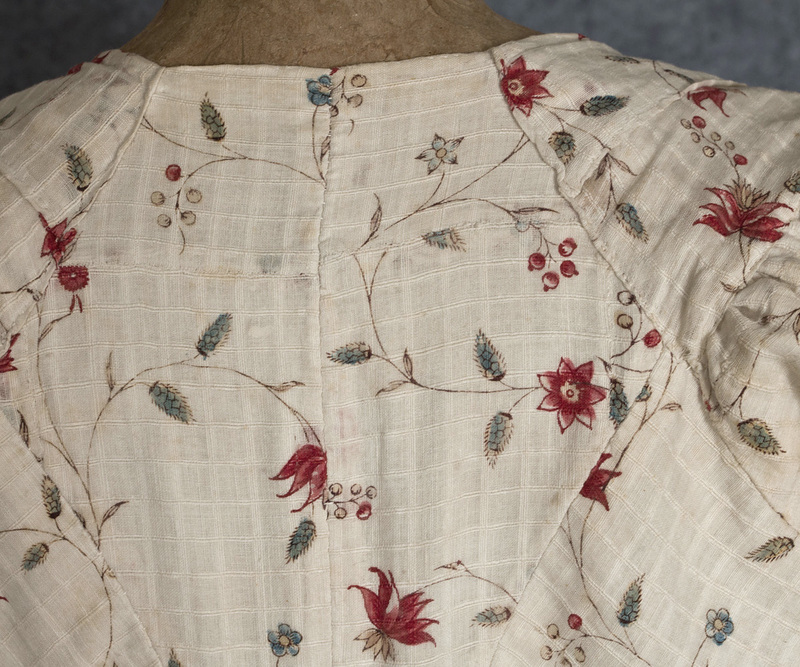 The bodice back was taken in at the center to make the gown smaller—a very old alteration done by hand. Only the size (but not the style) of the gown was altered. Thus, it was likely handed down and altered to fit the new owner. Indeed, it would have been foolish to have restyled such a fine gown. Across the ages, collectors and fashion cognoscenti can be thankful that the alternation maintained design integrity. The condition is almost excellent. Other than the size alteration, I found just one small spot near a pocket opening and as well as two paler spots near the hem. It measures: 36" bust, 27" waist, 14" from the shoulder to the waist, 57" from the shoulder to the front hem (longer in back if not pulled up).